Would you like a little help spending some time in the Word with your children during this busy season as we celebrate the birth of our Savior? 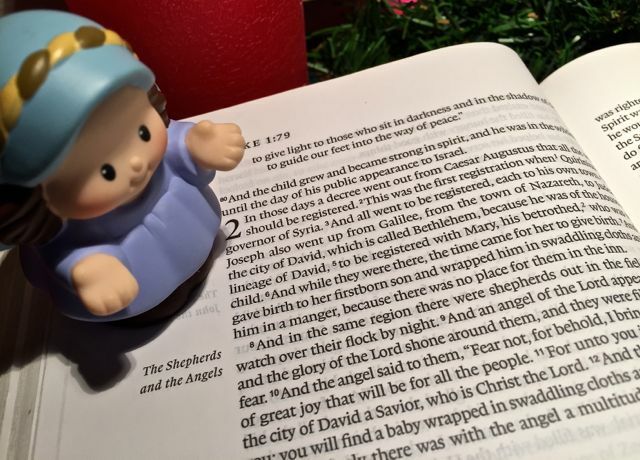 Right here, every day until Christmas, you will find a short Bible lesson for children. We’ll be reading Luke 2:1-20, listening for specific words, making lists, drawing pictures, acting out portions of the story, watching videos, and memorizing — much like we do in the children’s lessons in the Busy Mamas Bible studies. Does this sound time-consuming? It won’t be. The planning is all done for you! (And besides, what better way could you be spending your time during the Christmas season?) You just get to open your Bible, gather a handful of supplies once in a while, and spend some rich, memory-making time with your children! Here’s today’s lesson! You’ll need some paper and markers, crayons, or colored pencils. Open www.Bible.is on your computer or other electronic device (or install the free app for tablet or smartphones). If you’re using a computer, click the “Go to the Bible” button on the home page of Bible.is. Select ESV in the translation box just below the words “Bible.is”. Type Luke 2 in the search box and click the search button. Listen to the dramatized reading of verses 1-20. Ask the children to summarize the story and then each each draw a picture to illustrate some part of the story. Discuss your drawings and post them in prominent places in your home. I am grateful for this study. We begin today. We are going to combine it with a verse copy and drawing pages and make a story book to photo copy and give to the grandparents for a christmas present. Oh thank you so so very much! This is such a blessing! Thank you SO much for doing this! I usually do a scripture/craft each day at Christmas time and this year got away from me. This is perfect and we began tonight! I appreciate all you do!